Coach Kennedy Duran’s Lennard Longhorns have gone on a winning binge after a disappointing 1-2 showing in the Saladino Tournament last month. Lennard revved up its momentum with three straight victories: first, a donnybrook over rival East Bay and then victories with great pitching against Brandon and Chamberlain. The Horns are presently 9-2 overall and 3-0 in District 9, sitting atop the conference with only Braden River, 2-1, a threat to a Horns’ district crown. Longhorn senior Hayden Hensley has been a key contributor this season with stellar work as a relief pitcher and steady hitting at the plate. Coach Duran selected Hensley as Player of the Game in the 14-9 win over East Bay March 26. Hensley went 3 for 5 with 3 doubles, scored twice and had an RBI, and pitched in relief. This week, after press time, the Longhorns tangle with Tampa Bay Tech on April 2 and Armwood on April 4, both district games on the road. Lennard continues to play on hostile diamonds with a big away game against rival-neighbor Riverview Tuesday, April 9 at 7 p.m.
Lennard returns to the “farm” for a district game with Braden River on April 11 at 7 p.m. A good Strawberry Crest team comes calling Saturday, April 13 for a morning clash at 10 a.m.
Lennard scored five runs in the sixth on its way to a 9-1 victory over Chamberlain on March 30. 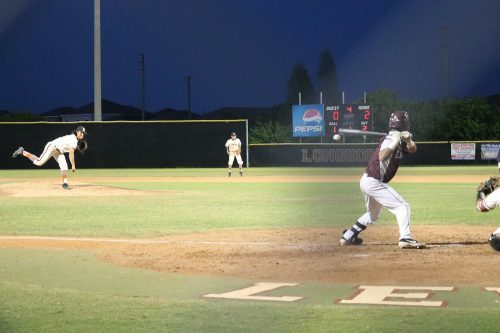 The offensive firepower by Lennard was led by Deuce Waller, Adrían Muñoz, Jordan Rutherford and Evan Barnwell, all sending runners across the plate with RBIs in the inning. Lennard fired up the offense in the first inning, scoring one run. In the bottom of the second inning, Chamberlain tied things up at one. Cameron Lassalle’s wild pitch allowed the run to score for Chamberlain. The Longhorns pulled away for good with one run in the third inning as Maxwell Goodnight drew a walk, scoring one run. The Horns erupted for five runs in the sixth inning to put the game away. Waller, Muñoz, Rutherford and Barnwell each drove in runs during the inning. 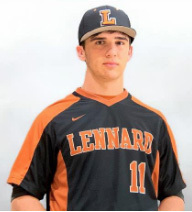 Lassalle earned the win for Lennard, allowing one hit and one run over five innings, striking out nine. Alex Williams and Randy Tavaraz threw two innings in relief out of the bullpen. Lennard had seven hits in the game. Muñoz and Hayden Hensley managed two hits to lead the Longhorns. In the Thursday game last week, Yazael Nuñez spun a shut out against Brandon, throwing a complete game and leading the Longhorns to a 4-0 victory on Thursday, March 28. Brandon fell to 3-8 overall and 1-2 in the district. Lennard got things moving in the first inning, scoring one run on Edward Tarrant’s RBI single to left field. Nuñez took the win for Lennard. He surrendered zero runs on one hit over seven innings, striking out 16. Nuñez was outstanding, throwing a no-hitter until two outs into the last inning with a single by Daniel Santana in the seventh inning for Brandon. Longhorns hard-hitting catcher Levi Montéro went two-for-three at the plate to lead Lennard in hits. Hensley also had a key 2-out RBI in the sixth inning But the star of the night was Nuñez. Two nights earlier, both pitching staffs had their hands full in a high-scoring affair where Lennard bested East Bay 14-9. The Longhorns took an early lead in the second inning. Montéro drew a walk, scoring one run. Lennard took the lead for good with three runs in the third inning. In the third, the Horns’ Edward Tarrant doubled on a 0-1 count, sending two runs across the plate. Tarrant started on the mound for Lennard. He surrendered seven runs on four hits over four and two-thirds innings, striking out nine. Lennard totaled 12 hits in the game. Hensley, Muñoz, and Montéro all managed multiple hits for the Longhorns with Muñoz and Hensley each collecting three hits. The Longhorns tore up the base paths, as two players stole at least two bases. Gabriel Mangual led the way with three. Lennard softball slugger Kiana Bradford celebrates on third base after driving in two more runs in the 11-1 thrashing of District 9 foe Brandon last Thursday, March 28, bouncing back from an 11-3 loss to East Bay two days previously. Coach Allie Montezuma’s girls, in Montezuma’s first year as head coach, head in to early April with a 2-0 district mark and 6-5 overall. 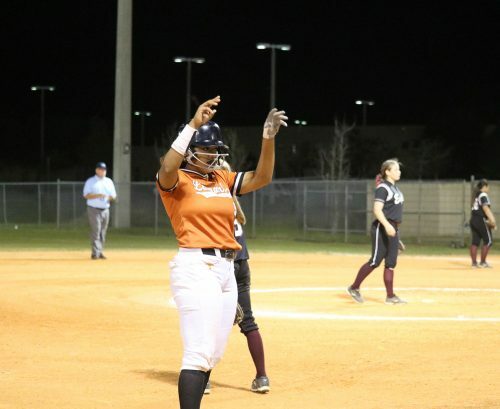 The Lady Longhorns travel to Armwood on April 4 for a district game and then return home to play Hillsborough High on April 6, Saturday at 10 a.m.